Whilst waiting on a batch of coals to mature, the sun waned over the roof tops, its golden beams glittering over the pond here by the pit. A doable humidity dallied in the air, and the tweety birds flirted about in the alders and cottonwoods. Lazy clouds of cotton idle in a sky of pastel blue. I positioned myself in my BBQ chair of leisure, and tuned in the Twins game on the pit radio. One of the finer joys of summer grilling, is listening to my beloved baseball team travel the country-wide, and play ball. Granted, they generally lose 2 out of 3, but that’s OK by me. They add to the BBQ ambiance if you know what I mean. An acoustic wallpaper of sorts, to blend with the soft banter of nature. The coals in the charcoal chimney are getting there. They are in no hurry it seems, which is fitting for our style of the BBQ sciences. 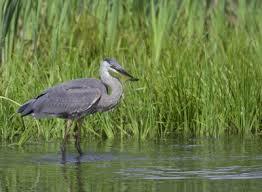 No hurries, which off-hand and by-the -way, is the attitude also of the lonely Blue Heron down by the pond. He was in the middle of supper when I sat down, and like many a bird tends to do for some reason, had his spoils clamped firmly in its bill. Tighter than Bill Gate’s vault I would wager. He stood there, backed by tall weeds leaning in the breeze, for what seemed minutes on end, with nary a motion usually reserved for dinner bells and the like. Other than when these fellows harpoon their intended quarry with the fierceness and accuracy of a Samurai warrior, they are one of the slowest, most graceful moving birds I have seen. Deftly stalking the shallows no faster it seems, than the sun arcs yonder through the heavens. I am always and quite dutifully impressed by the innate patience they seem to harbor for their craft. No hurries. 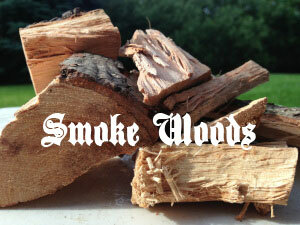 A motto undoubtedly suited for the BBQ arts as well. By the time the Heron commenced with choking down his fish, my coals were ready. I thus banked them to one side of the old kettle grill as usual, for some in-direct cooking. Tonight on the grill, we have something special. Something sure to sooth the savage sweet tooth. 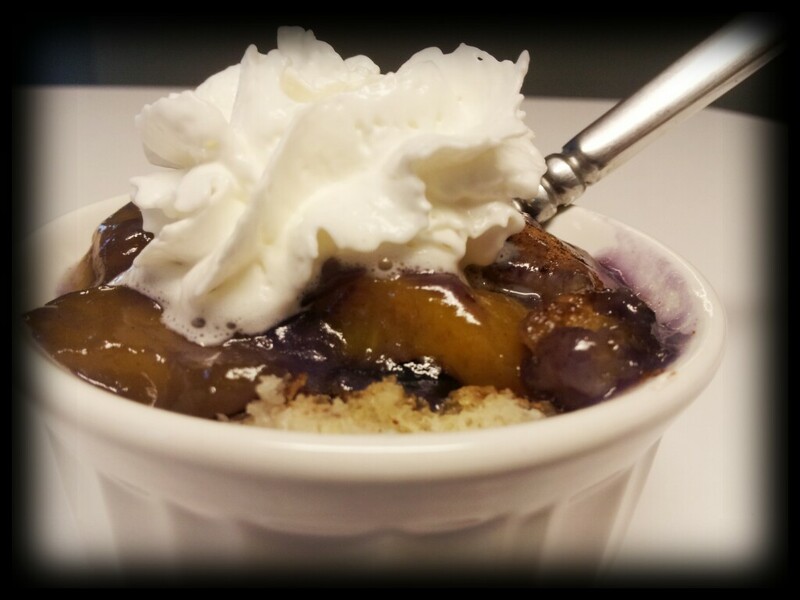 Homemade Blueberry Peach Cobbler. Adapted from a little ditty we found at Man Cave Meals, a great site if you’re looking for more on the art and zen of BBQ. There are a lot of words we might use to describe this fruity delight, but “Yum!” about says it all. Let us then get after it, for the patience, I must admit, resides better now with the Blue Heron. This is good eating! 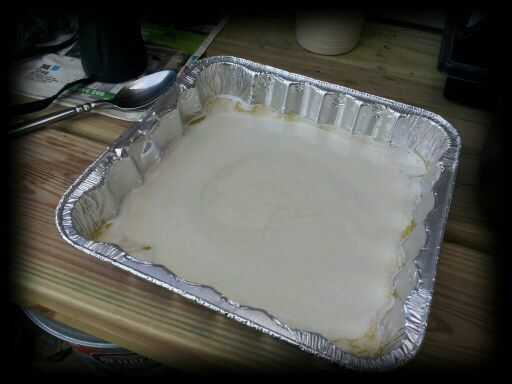 In an 8 x 8 pan, or roughly that, and over a half-stick of melted butter, pour the batter gently. Resist, by and far, the urge to mix it all up. Just let the batter mingle for the sides of the pan. Advancing at its own good speed. Pour this beloved mixture of sweetened fruit over thy batter with a gentle, yet well-meaning hand. Then, mostly for culinary poeticness, lightly dash some cinnamon over the whole ensemble, and place the pan opposite the hot coals. Go head and put the lid on and do what you do best! Grab a lovely beverage and tarry in the good ambiance patron to the pit. You’ve had a long day no doubt, and you sort of owe it to yourself, don’t you think, to kick your feet up and relax a little. To feel the summer breeze whistle through your up-turned toe-pits. To partition a little time off the clock today, and let up on the accelerator pedal of life. To boldly let the world spin with out you for a while. For life goes by fast enough as it is, so let us not rush it of all places at the pit, doing that which we feverishly love. For this is your opus now. This grill. This evening. The aromas of baking cobbler. The way the sunbeams slant over the green grass. The moment is yours to seize if you want it. All you need do is sit there, and watch it all unfold. No hurries people. No hurries. In about 45 minutes, or when the batter has browned over a touch, or when it passes the toothpick test adequate to thee – it is done. It’s also always good, when baking via this method, to turn the pan 180 degrees mid-way through the cook, for even cooking. I brought the wondrous dessert inside, and my what lovely aromas tarried with it. Served hot with whipped cream, or better yet, a scoop of your favorite ice cream – glory be!!! A tastier dessert from the grill nor even the oven too, you shall not soon divine. 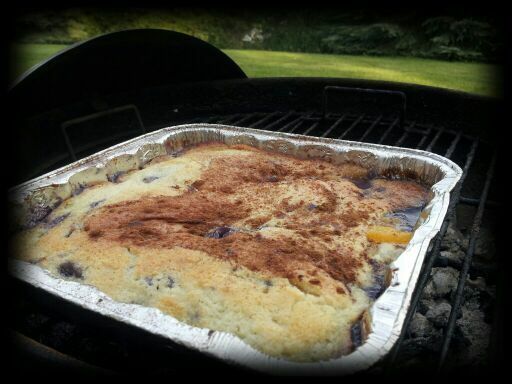 Hot Blueberry Peach Cobbler off the grill. Like that old heron with his fish, there may be more yummy things in life, but right now, we can’t think of any. And getting there was half the fun. Amen. This entry was posted on June 26, 2013 by Patrons of the Pit. It was filed under Uncategorized and was tagged with barbecue, barbeque, bbq, blue heron, blueberry peach cobbler, cobbler on the grill, cooking, dessert, food, foodie, grilling, humor, patience, pit, pit master, poetry, weber, writing. Wow, looks so good, and I’m blown away by how beautifully it was written! Thank you! Really appreciate that! That is too cool, auntidoni. A joyful soul you are! I shall not argue with your logic! I love reading your blogs – you’ve got quite a talent for visual writing 🙂 I feel like I’m watching the Heron right along with you. I love to grill peaches! Thanks for this delicious post! Thank you very much for that. Appreciate it. 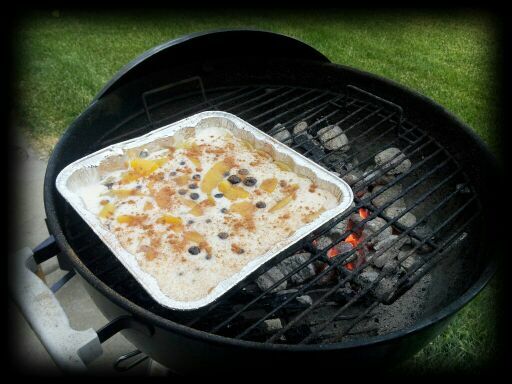 I had no idea that you could make a pie on the grill…thanks! I am amazied. You baked a cobbler on the grill, it looks fantastic. Well done! amazed, was so verklempt I forgot how to spell. I get verklempt sometimes too. Its cool. 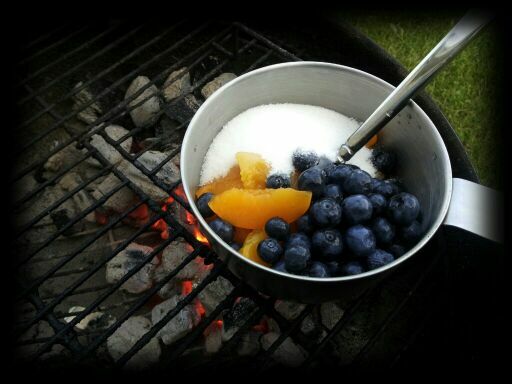 We just had our first big camping trip of the year a few weekends ago and we made peach cobbler on the grill. 🙂 Of course, we used a much shorter recipe, but it was really cool to put it on and let it sit, and the smokey flavor was unique. We will totally be making it again the next trip! And I’ll be packing ice cream to go with it! Ah that’s the good life there. All food tastes better in a campsite, if for no other reason than sheer location. Cool you had a good time. You must have an RV if you’re packing ice cream! Thanks Kate! nice of you to drop by! Mini fridge! Funny you should mention such antics as this. For our co-host’s wife is camping right now, and she too admitted to getting an electric site at the campground, just so they could plug in her mini refrigerator there. And tho I must shake my head in disdain, I suspect there is no denying the acute pleasure of a cold dish of ice cream in a hot, summer’s encampment. Bless ya. You’ve crossed the line, but bless ya anyways! Oy vey… Now I am supposed to get out of bed to calm the munchies! Awesome it looks, tried the taste, but tastes of screen no matter how hard I lick the screen! Have you missed out any ingredients? Looks great!!! I love doing dessert on grill. Will have to try this out! Yeah its fun. This recipe turned out real good. I would make it again for sure. I’d swear you guys came up with this just for our Wyoming trip! Can’t wait to try it. Ya never know! Its quite tasty, rest assured. Safe travels Mrs. Deerslayer! Ah yes, toe-pits…The over-looked, less-appreciated pits. Glory be it was good cobbler, Liz! Thanks as always for your great comments! You’re our #1 comment maker now, according to the stats. Well-done Lass! And thank you much! Exquisite recipe, you could have invited the Heron over for a taste. It was tasty alright. Not sure if the heron would have thought so. A very well-written piece. I’m going to love delving into these writings. Well done! Thanks man. Like-wise on your site! Cool. Its worth the effort. Very tasty! 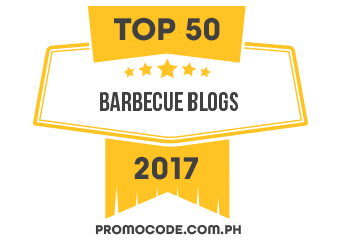 Thanks for the blog and for the support! Wow, thank you kindly, Nia! Thanks so much for liking my post!! You recipes look slick as! Peaches are at their prime in southern New England. This looks fantastic. Sounds good. Yeah, you’ll like this recipe. One of the best things we grilled all year so far. And it had no meat, go figure. Sounds like a great recipe. Will have to try it! 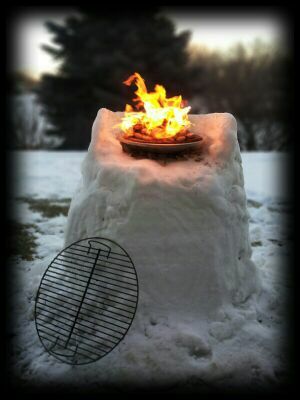 This is soo impressive, you make me want to go out and guy that barbecue grill! Well what are you waiting for!